Use pear-flavored vodka, lemon juice, and a simple syrup to make this pretty cocktail. The drink is served with fresh pear slices. In a pitcher, combine syrup, vodka, juice and ice. 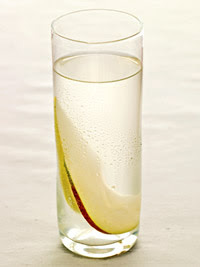 Strain into glasses containing pear slices. Makes 4 servings. Calories 155, Total Fat 0 g, Saturated Fat 0 g, Cholesterol 0 mg, Sodium 1 mg, Carbohydrate 25 g, Fiber 1 g, Protein 0 g.
This entry was posted on 2:28 AM and is filed under Drinks . You can follow any responses to this entry through the RSS 2.0 feed. You can leave a response, or trackback from your own site.